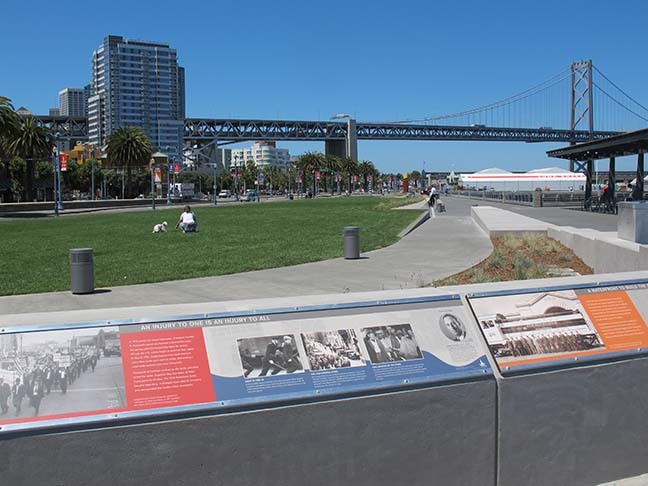 Located on The Embarcadero Promenade between Piers 30-32 and Pier 38, the Brannan Street Wharf is a 57,000 square foot public park parallel to the Embarcadero Promenade that reaches out into the Bay. The Wharf required the demolition of historic Pier 36, a pier shed and platform which was condemned due to structural deterioration. Planning policies of both the Port and the San Francisco Bay Conservation and Development Commission (BCDC) called for the creation of Brannan Street Wharf in the center of the South Beach waterfront. Working with BCDC, the Rincon Point-South Beach Citizens Advisory Committee, neighborhood, waterfront, and regional stakeholders, the Port conducted a public planning process to develop the concept design for this park. Brannan Street Wharf is a wedge-shaped park. Its narrowest point is located south of Pier 30-32. The park then extends south for 830 feet, widening to about 140-feet at the south end between Pier 36 and Pier 38. The major project components include a 400-foot length lawn area, a waterside walkway with seating, a shade structure, and a small-craft floating dock for kayaks and recreational water vessels. The design references its San Francisco waterfront history by taking on the shape of Pier 36 in its original location and through interpretive exhibits. The level lawn of the Wharf is contained in a raised planter of about 18-inches in height and surrounded by a seat wall. The openness of the site is intended to orient the Wharf both toward the Bay and the adjacent neighborhood. The concept design underwent extensive review in joint meetings of BCDC's Design Review Board and San Francisco's Waterfront Design Advisory Committee. The Port worked at many levels to secure funding from several sources to implement the project. In addition to $17 million in Port funding, Brannan Street Wharf received $3 million in Proposition A General Obligation Bond funds approved by San Francisco voters in February 2008. 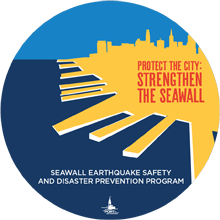 The Port also worked in coordination with the U.S. Army Corps of Engineers, which received $4.5 million in federal funds for the demolition of Pier 36.